Yesterday, a perfect summer day. My daughter and her beau was helping in the garden, and after dinner ( shallots,orange peppers, chili, spring onions and garlic with pieces of cod on top, wrapped in foil in the oven – sprinkled with lime,butter and dill-weed) we played Boule in the garden. Then Francis threw his boule – and it hit mine and clinked it right into the red ball, where it rested softly in the grass. It could not be a more perfect hit – and I did not even have to do it myself. I had to know that I could “win” – reach the goal, go Home – and what was shown to me is that someone else will support my wish. In other words: the choice is mine – the absolute faith in my ability to reach my goal is vital – and then the others will support my wish – since this wish is the wish of us all. I am in a Mall. (It strikes me that it is a symbol of the place where ego shops for believes and ideas that are fitting -) I meet Tom Cruise – he tells me that he works with people who are go-betweens – who carry important messages, and who must do this in secret because there are people who are afraid of the messages and will see them as a threat. – Would I like to be a messenger? I would – and he takes me into a locked room in the center. He gives me the message on a bit of paper, I fold it in 4 and leave the room. Near the exit I see the person I shall give it to – a very tall female security guard in uniform. 7 feet I think. I did it! It was simple! Mission possible! She accompanies me out of the center. I have been the instrument of liberation, and it feels great. Then I fall asleep again – and in the state of half-slumber my body does a jolt: there is a feeling of shock, terror – and then peace. Something left my mind/body and I felt it on its way of passing out of my energy-field. A deep relaxation spreads – and I hear that my willingness to be a “messenger” – set this inner liberation off. I have felt this exact shock and fear before: a metaphysician removed some dark stuff from my aura. Later, with eyes closed, another sensation occurs; one second of utter complete dense darkness – then it is gone. I am relieved at knowing that I have given my process of healing to Blue – so what I feel now is leaving, and not entering. It seems that I still believe darkness is lodged in my aura and mind, and for the first time I do not fear that thought – my willingness to bring all to the Holy Spirit is liberating me. After my shower, the phone rings. It is my doctor! On my way down to the (real) Mall later today, I realized for the very first time that if somebody looked angry, it had to do with them. I was not in danger! If somebody looked lost, I did not have to feel responsible for comforting them. Some huge hooks, that before were invisible to me ( or impossible to do something with) were gone. Some days ago, I visited an exhibition in a wood-area, called “Lost Home.” One of the many artists, Christine Balsløf, had placed a number of mirrors into the landscape. 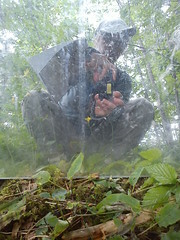 I took many photos: the 2-dimensional “me” in the 3-dimensional wood captured in a 2-dimensional photo. I then sent the photos to my daughter, who commented that what I held against my right shoulder did disturb a bit. I felt a huge storm of hatred and energy coming at me: how COULD SHE attack me in this way! I wrote her a curt mail pointing out how unloving that was and had a quite horrible day. The next day, I was willing to ask for help to see her as innocent. I did not feel any difference inside – but later, I looked at her mail again and was flabbergasted. How in the world was it possible to see her remark as an attack? And that’s when it dawned on me that I had just been caught in the old paranoia – and had projected it on her. I mailed her instantly and told her I had been wrong – she mailed back hugs and smiles. Somehow I have chosen to believe in the old stories rather than believing the truth. I mailed Barbara and ranted. Why could I not be finished with all of this repetition of patterns, when I had got it 30 years ago? Today I sat down and allowed Blue to speak through me – He spoke to the tortured girl-identity, and told her that her only problem is that she has believed that she was without God in those torture-moments – and has allowed herself to believe in all the stories and interpretations that came out of believing in separation. I shifted between “being” the girl and the Love that is speaking to her – and sitting in that loving embrace, as the girl, it gradually became clear that all my stories were false – they all came from the belief that I was separated and therefore guilty. Leelah what are you trying to heal? What is sick? You are not a body. You are as God created you without form. How can form need healing? Yes the thoughts, feelings, pain will come. The shift that takes place is seeing that just because they come; which they will because that is their job, does not mean you are not awake. You are just as awake as Myron and I. All you have to do is believe it. Simply believe I AM awake because nothing else is true. All Myron and I did was simply believe. Last two nights, waves of dark mean energies. Very fast comes a shift in my mind to let this go to the Holy Spirit: I will just relax as I feel the energies but do not give the thoughts of danger and evil any serious meaning. A moment ago – its Monday now – I felt huge waves of hatred pouring through me. A short moment of judgment and shame – then listening to Blue: “Just something/somebody calling for love, in the only way they have learned.” Instantly my mind shifted to gratitude: Of course I want to extend love to this. The little willingness created a big shift in me. Now I am just releasing energies – not “doing” anything, just allowing it to happen. – I am at my age and process at a place where I am saying goodbye to outdated roles/identities. I am talking about one of the main role-expectations of a therapist: be available when your clients need you, and when they are in crisis. I am being guided to see that I need to let go of this: as long as I believe this is my responsibility, I can never fully allow myself to rest. This is my summer vacation – but as long as I still have this role/therapist-identity open and running, my psyche is always alert. I can never fully relax. This role is a compulsion, originated in childhood: your only justification for living is being the psychic receiver for the family’s shadow. I think it is the most common impulse for becoming a therapist: so many of us have learned that this is the only path that is open for us to receive gratefulness and maybe even love and admiration. As it becomes clear for me that I will drop this role – I see what a HUGE ego-trap this is. And what a boost for the ego, which is now indispensable and powerful. Myself, I am very grateful for my last therapist and Buddhist teacher: he WAS always available – and loved it! He stressed that a good therapist, as he saw it, had to be OK with patients being dependent on him/her – because that was an important stage in developing a healthy ego. He was the good father for me for many many years, and I love him for it. And now it is time to let it go- and allow my own process to be my first focus: I want to allow the healing I took birth for, as Stephen Levine puts it. Dear X – please sense and find out if this is something you can accept and live with: somebody who gives you the full responsibility to find the wisdom, love and comfort inside yourself – and who will share methods to do this., and walk with you as you learn and grow and take risks. And know that it is OK to still need such an available therapist – then you need to find one of those. But if you say yes to work more with me, you are no longer seen as a client or patient, you are not receiving “treatment” – you are a student. I sense the great space opening around me when I step into this role: here I am free – and there are no expectations, no cords to the past. I wrote this yesterday. Today I spent with my daughter. She was sick -and I offered some methods that might bring love and comfort into the roots of the sickness. She listened, and I sensed the deep skepticism and resistance. For some seconds I picked up the old role again – before I remembered that she has exactly the potential that we all have, it is up to her to choose and experience the consequences of her choices. Whatever happens is part if her process of learning. When I let it go, I sensed the rage of the ego: it had lost its moment of being the one with more power to heal than the other. Oh I am so aware that I will drop back into the morass again – but as long as I forgive it and smile at it, all is well. Accepting myself where I am RIGHT NOW – AND NOW – is the job.